Norwegian fruktsuppe, or sotsuppe, joined rommegrot (cream mush) as a food carried to new mothers by the women of the community. The custom known as sengemat (bed food) dates back to the Viking age and was continued well into the twentieth century among immigrants in the New World. 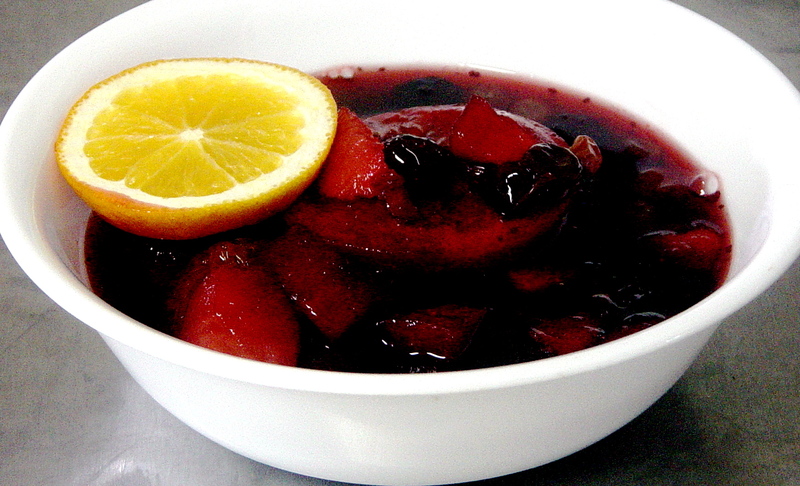 To make sweet soup, add the following ingredients to a double boiler: one and one half quarts water, a small can of grape juice, one cup mixed dried fruit, one cup prunes, one half cup raisins, one sliced lemon, two sliced oranges, two chopped apples, a half cup sugar, two tablespoons sago or pearl sized tapioca, and a stick of cinnamon. Cook covered until the sago is clear, adding more water as necessary. Citrus fruits may have been scarce in nineteenth century Norway but this recipe has evolved to reflect the changing realities. You may add almost any kind of fruit or berry that you have available, including apricots, cherries, pears, and so on. If the fruits are sweet, you may need to cut down on the sugar or eliminate it altogether. Be sure to remove the cinnamon stick before serving. Fruit soup is traditionally eaten cold but it’s also good warm, garnished with an orange slice or topped with a dollop of cream or ice cream. My recent attempt at sweet soup didnt taste very good. Don’t make these mistakes! I added cranberries to the mix, which were pretty and pretty sour. And oh by the way… I didnt use real frozen grape juice. A single serving Black and Decker coffee maker sat around in its box for a year or two. Finally I decided to try out this appliance, which had been a gift and I had been unsure of its usefulness. After a false start or two, I produced coffee deemed “the best I’ve ever tasted” by a friend who had certainly drunk certifiably gourmet coffee, living in France and then in Madagascar where her housekeeper roasted the beans fresh daily. I used and used that coffee maker, even though the pods were an extravagance, until I stressed out the machine and it wouldn’t go anymore. Months later, I tried to find a replacement. No store in town carried single serve coffee makers. Finally, my brother found one—the discontinued display model from a hardwre storage room. The bargain price ($4.50) seemed too good to be true. It was. The new machine produced coffee that was vile and bitter. I bought different types of pods—Colombian roast, classic roast, decaf—both Folgers and another ritzier brand. All were terrible. I tried shopping at other stores. Nothing made a difference. The coffee was bad, bad, bad. Yes, a good tasting cup of coffee is elusive. We sip our way through mediocre quantities in search of that one “good coffee”. But this brew didn’t come close, and I wondered if another factor was at play. Maybe my tastebuds? Or did companies manufacture good pods at first to get people hooked, then switch over to an inferior product? Or were these machines so unpopular in this town that all the stock on the grocery shelves was dried up and again? Coffee pleasure goes through stages. Sometimes, even a jumbo can of store brand tastae delicious. At other times, beans ground at home produce an indifferent brew. You are currently browsing the The Blueberry Tales weblog archives for January 2009.